This is a revised version of Tears of the Forgotten because I felt there was something missing about it. Now, just a week after the crowdfunding campaign of "Myre - The Journey Begins" has launched on Indiegogo, we have reached over 115% of its final goal! Guys, you are absolutely amazing! I don't know what to say...Thank you so much! This character in the picture is Vunsvagh. He is one of the key characters in the story "Myre". Of all the creatures and mysteries in Myre, there are none so cloaked in darkness and sorrow than Vunsvagh. Who he was or what he is has been lost to legend, now the only whispers of his name are done so in trepidation and warning to never stray into the dead forests of Yria. Tales of a creature stalking the swamps of the dead forest tell of a vengeful monster catching up foolish travellers are naughty children and devouring their souls. They say that any who enter his realm are never seen again and that to even tread to close to the swamps is to invite a fate worse than death. Just as a skilled story teller would weave his ghost story around a hearth fire, parents tell their children of a haunting wolf of a man, stalking the sucking and foetid swamps, bringing with him a swarm of thousands of plague infested rats. Where not the swamp itself a horror in and of itself, with its twisted and haggered trees like giant raking claws and its murky depth-less ink holes, one would be disinclined to go there ever. And yet for Vunsvagh, it is an unnatural fear all the greater. Surrounded by his horde of rats, Vunsvagh stalks the perpetually night-dark swamps, howling in anger and crying into the night. Of all the stories across Yira, his' is the most feared. But the parents who tell the tale, often remind their children that if they don't go near the swamps, they'll be safe from Vunsvagh for he cannot escape his prison because of a magical curse placed upon him. Thank you so much for looking and most of all, thank you for your generosity and support! This truly means the world to me! This is absolutely beautiful and stunning. The immense level of detail reminds me of Stephen Gammell's work. Nice work. The title of this great art reminds me of RyanDan's song. The "depth of field" is great ! Wow you are really good with expressions. Amazing detail. Awesome work! What a wonderful expression of sadness. 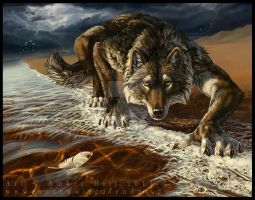 I just want to take the wolf into my arms and give him comfort! WOW. O_O Thats an epic bed time story. Geezum.. ;w; This picture made my day. Brought tears to my eyes. How sad and beautiful. This picture is stunning. The atmoshphere is so dark and full of mystery! "...and all we do all day long is whisper naughty things into his ears..."
Why white Bears Eating & Like Women meet check this like details??? Fantastic work! Striking and memorable. Veeery happy you revisited this one. The difference is quite interesting. The lighting and the rats are both particularly good additions to the piece. Amazing piece, I feel allot from it. Gorgeous picture, I love the moodiness as well as the back story.